Childhood and adolescence are the stages in life when the most dramatic voice changes occur. The voice changes as we age, because the larynx (or voice box) and vocal cord tissues mature gradually after late teenage years. The voice also changes due to some chronic medical conditions, as listed below. The voice change associated with age, is because of loss of muscle mass, thinning and drying of mucous membranes, which lead to loss of fine coordination. It is no surprise that these changes occur in the larynx as well, and this leads to changes in our voice with age. Besides the natural voice change with aging, you will be surprised to know that a variety of medical conditions can lead to voice problems. The foremost symptom associated with the throat cancer is a change in voice quality. This change persists for more than 2-4 weeks. The voice often becomes hoarse, rough or raspy. Individuals who smoke are at the greatest risk of developing throat cancer. Early diagnosis allows for more successfully treatment, with a cure rate greater than 90 percent. Therefore, it is important that if you're a smoker, you should get examined if you have persistent hoarseness or change in the voice for longer than 2-4 weeks. Treatment options include surgery, radiation therapy, and/or chemotherapy. Vocal cord paralysis is caused when the nerve impulses to your larynx are disrupted. In vocal cord paralysis, both vocal cords (vocal folds) are unable to move. The paralysis is usually due to damaged nerves going to the vocal cords because of viral infection, surgery or trauma or due to brain damage. 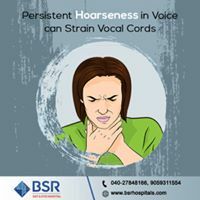 The symptoms associated with vocal cord paralysis include hoarseness in voice, loss of vocal pitch, inability to speak loudly and breathy quality to the voice. Also, vocal cord paralysis results in airway and swallowing problems. Patients observe improvement of the vocal cord function within few months. Treatment options include speech therapy. Surgery is also prescribed in some cases which include repositioning of the paralyzed vocal cord closer to the normal vocal cord. These are non-cancerous growths on the vocal cords that affect the voice. Vocal cords are tough fibrous bands located in the voice box in the middle of the neck and covered with a layer of tissue similar to skin. With the usage, the upper layer thickens and overuse may result in the formation of polyps or nodules. A polyp is a smooth lump containing blood and blood vessels. A nodule is similar to a polyp, but likely to be firmer. These nodules, polyps and vocal cord cysts may deteriorate the quality of the voice. Vocal cord cysts are collections of fluid in sac-like formations on the vocal cords. At the initial stages, these cysts can be treated by vocal training and speech therapy along with few medical interventions which will decrease the initiation of the cyst. In some cases, cysts grow larger, requiring removal with surgery. In some cases, stomach acid may backflow to the throat, causing irritation of the voice box. This irritation is more prominently experienced near the back of the voice box, closer to the oesophagus. Symptoms of this disorder include hoarseness, swallowing problems, a lump in the throat sensation, frequent throat clearing and sore throat. Change in voice quality and persistent hoarseness is the foremost warning signal for vocal cord lesions. Other symptoms also include unreliable voice, breathy voice, low pitch, voice breaks, rough voice quality etc. Hoarseness can be prevented by quitting smoking, avoiding dehydrating agents, avoiding spicy foods etc. By following a few tips, hoarseness in the voice can be relieved. Tips include: hydrating home, drinking plenty of water and avoiding using loud voice. Vocal cords are composed of paired infolded bands stretched across the larynx. They vibrate, affecting the flow of air being expelled from the lung, resulting in various sounds. The vocal cords are open when you breath in (inhalation), closed when holding one's breath, and vibrating for speech or singing by opening and closing. Vocal cord haemorrhage occurs when one of the blood vessels on the surface of the vocal cord ruptures and the soft tissues of the vocal cord get filled with blood. General causes of vocal cord hemorrhage include yelling, shouting, or other strenuous vocal tasks. The only treatment option includes absolute voice rest until the haemorrhage resolves. BSR ENT Hospital is well equipped with voice treatment facilities (equipment and technology), including speech therapy etc. It has the latest technologies and experienced specialists for every area of ENT. Senior doctors like , Dr. B. Shanker Rao, MS, DLO, FICS (with over 40 years of experience) and Dr. B. Kalyan Chakravarthy, MS ENT / Head and Neck Surgeon, are highly qualified with extensive knowledge and experience in treating problems related to ENT. BSR hospital is known for its successful clinical outcomes and patient satisfaction. The hospital has an in-house laboratory for diagnostic tests, making it convenient for patients to get their tests done instantly. We also maintain online patient records, enabling quick diagnosis with past history of the patient in our records. Our ENT physicians are specialized in performing minimally invasive procedures with advanced techniques facilitating the quickest and safest post-op recovery.